Newars’ festivals start from Gathanmugah and ends in Sithi Nakhah. 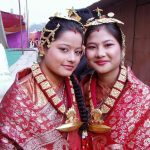 Therefore Gathan Mugah is also known as Kayahmacha Nakhah (the son festival) and Sithi Nakhah is also known as Mhayamacha Nakhah (the daughter festival) in Newar culture. No festival is observed in between Sithinakhah and Gathan Mukhah as the farmers are busy in the their work at that time. The festivals celebrated by the Newars are related with their places and lives. Thus through the festivals observed by the Newars, one can know many things about them. 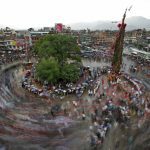 Gunla is one of month-long festival that celebrates in the middle of the monsoon according to the lunar calendar in “Nepal Sambat” and matches to August in the “Gregorian calendar”. Gunla is a sacred month of Newar’s Buddhists while reciting the Scriptures, observing hunger and visiting to holy pilgrims with religious music. Gunla is one of the most important events in Newar Buddhism that observing the holy month is a descendant of the rain retreat greeting to Buddha while the monks stayed in one place and taught the Dharma. 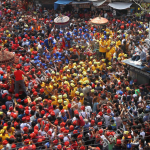 Newar Buddhists followed the Gunla Festival since ancient times. It will be celebrate from Gunlatho to Yalatho i.e. 20 days of monsoon month with various cultural music and traditional activities. Day after day in every morning, the sincere Buddhist monasteries pray Bajan Gunla along with cymbals and shwam. Gunla Festival is not only about Newar festival, but also includes historical significance for all Nepalese living across the country. In this festival, group of people from different age from 5 to 80 years old all be playing nine different kinds of traditional musical instruments together. Duration of the Festival, prayers eat only once a day without salt and travel across the “Chaityas”, “Gumba”, “Bihars” and also many other Temple prays to Dhanla and the other for a month. First day, known as Gunhu Punhi, the Newars drink broth consisting of spouted mixed cereals. Everyone gets doro, a protection cord tied in one’s wrist from the brahmans. On this day, food is offered for the frogs in farms, which is known as Byanja Nakegu. Tihar, the festival of light lasts for five days. Swanti stands for Swanhu Ttithi which means three days in Nepalbhasa. Among five days of tihar three days are mainly celebrated. On the day of Laxmi puja, Laxmi, the goddess of wealth is worshipped and in the evening lights are burnt to invite Laxmi. Mhapuja is the day of worshiping one’s body. 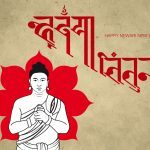 This is the new year’s day according to Nepal Era. Kija Puja , the last day of the swanti, is dedicated to brothers. Sisters worship their brothers on this day. 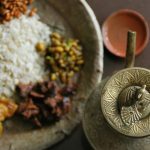 Pahan chare or Pasa Chare is specially observed in Kathmandu only. On this day, Mahadev in the form of Pisach (Lukumahadyah) is worshipped. Thus the festival is also known as Pisach Chaturdasi. 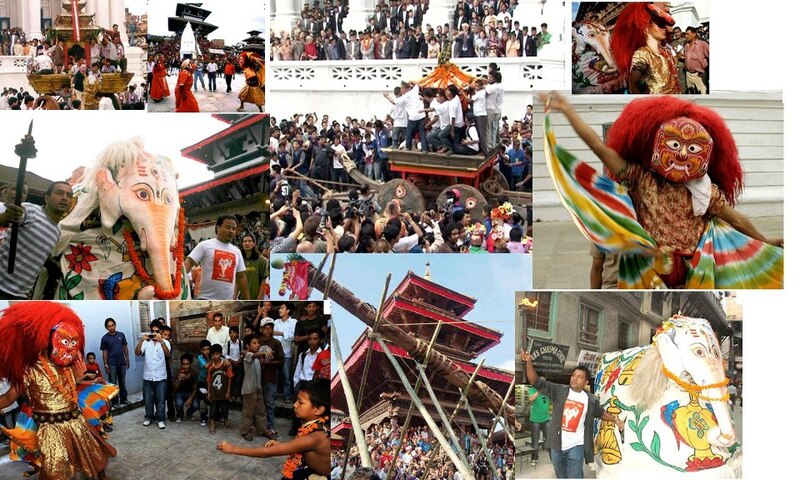 Different palanquin circumlocution takes place in Kathmandu for a week. The word ‘Biskah’ or ‘B isket’ is said to be derived from ‘Bee Sikah’, which means ‘after death of serpents’ . It is said that this festival was begun to celebrate after after the death of serpents, serpents described in various legends. Even though it is said so, from various chronicles, sacred writings, inscriptions and the culture of Bisket, it is known that it was not used in the sense of death of serpents. 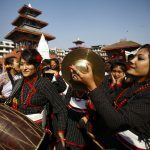 This festival is celebrated mainly in Bhaktapur and Thimi with Chariot festival, tongue boring festival and with music and dances in other parts of the valley as well.